The acronym stands for Piping and Instrument Diagram. 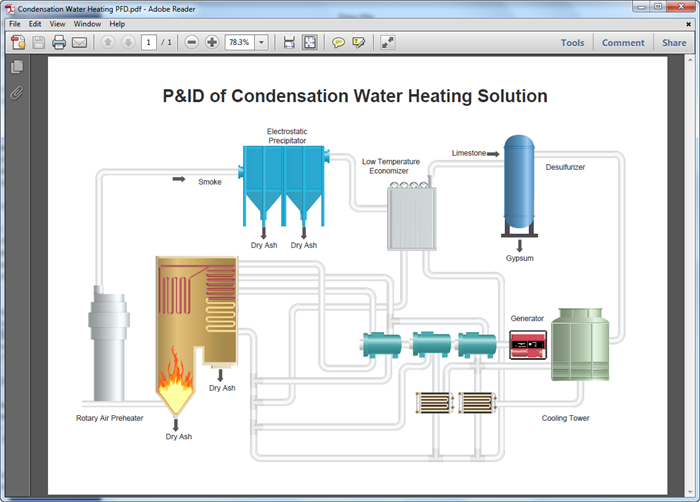 This is a document used to show a graphical display of a complete system or process with-in a plant. This would include all piping, instruments, valves and equipment that make-up that system. The P&ID shows primarily the mechanical parts of the system. There is some electrical detail shown because of the process controls schemes which are depicted;such as the controllers, loops, etc. The P&ID is generally revised by the process or controls engineers before the construction documents are revised or generated. Make professional and nice-looking P&IDs for PDF instantly. Use a simpler app to do it which is hard to gain in MS programs. 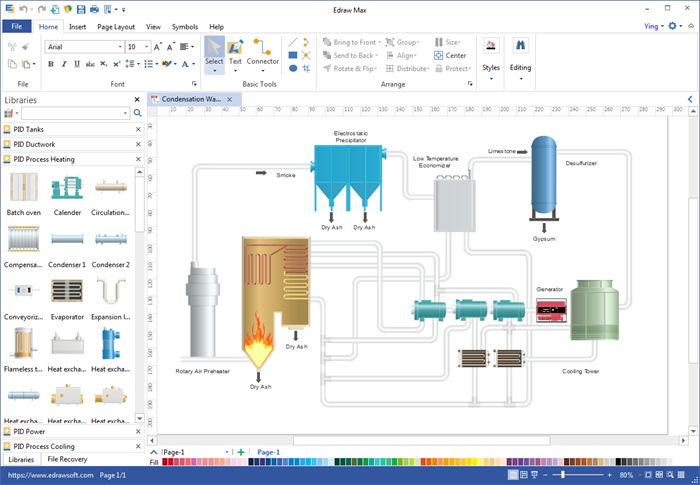 Rely on an auto diagram software to gain better piping and instrumentation diagrams. Things become easier because you don't need to draw shapes. You just need to drag and drop built-in shapes. Pipes can be linked automatically. It offers total integration to PDF. 1 click turns the file into perfect PDF document immediately. The fastest way to create P&ID is to start from templates. Just fill in your content and customize the appearance to gain your desirous P&ID. Edraw's built-in symbols can also help you get started quickly and save time up to 50%. See how easy it is from the following tutorial. 1. On the FILE menu, move the cursor to New, point to Engineering or Industrial Automation, and then choose a drawing type. 2. From symbol libraries on the left, drag and drop instrument shapes to the drawing page. 3. Drag pipeline shapes to connect major equipment. If necessary, use the floating action button to change the radius of pipelines. 4. Add other kinds of shapes such as valves. Click on the library button to open the library you need. 5. Resize shapes by dragging its green selection handles. Relocate shapes by selecting and dragging them. Recolor symbols through Fill or Theme tool. 6. Double click a shape to add text to it if there is an attached text box. Or use Text button to draw text boxes. 7. Go to FILE menu, click Save to save your P&ID to local folder, personal cloud or team cloud. Or export the file to a needed format by clicking the Export and Send button. You don't need to worry even if you are totally new to P&ID. You can get inspired by our well designed examples. Just download them for free.